Butcher's Broom is a member of the lily family that grows in the Mediterranean. 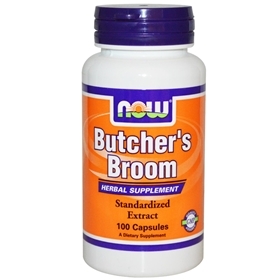 Butcher’s broom is an evergreen like shrub with a long history of use in Europe for promoting circulatory system health. Among other benefits, butcher’s broom helps tighten blood vessels and capillaries, which has generated interest for use against varicose veins. It’s also been shown to relieve fluid retention and other symptoms of chronic venous insufficiency. Varicose veins and hemorrhoids are common and associated with a loss of blood vessel integrity, & Butcher’s broom is improves both conditions by promoting healthy microcirculation, capillary flow, and strengthening connective tissue.